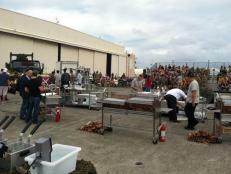 This weekend it's about holiday feasting and holiday competition on Food Network. Tune in Saturday afternoon to see Rachael Ray’s Easy Holiday Feast. 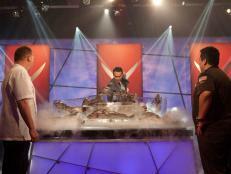 Then in the evening, two teams of Iron Chefs have a Winter Ice Battle. On Sunday morning, watch Farmhouse Rules, where Nancy hosts a canning party and cooks up a seasonal menu. 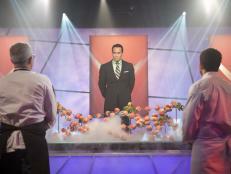 In the evening, watch a special holiday edition of Guy's Grocery Games. 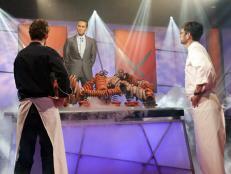 After, it's the season finale of Restaurant Express: One of two finalists will win a restaurant in the M Resort in Las Vegas. 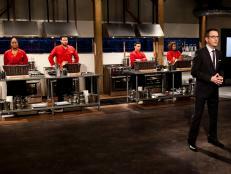 Finally, watch the new season premiere of Cutthroat Kitchen, where the chef sabotage continues. It's the holiday season and your friends and family are on their way over — with their appetites. Rachael Ray's holiday gift to you is a festive meal for a crowd with everything but the stress, and on your table in under an hour! At the center of the table: Soy and Cider Brined Turkey on Toast Points with Maple-Soy Gravy. To go with that, three delicious sides: Paprika and Orange Scented Mashed Sweet Potatoes, Barbecued Corn Succotash and Roasted Sugar Snap Peas with Black Pepper. The holidays have never been so deliciously easy! Iron Chef America : " Winter Ice Battle "
Iron Chefs Bobby Flay and Jose Garces take on Iron Chefs Masaharu Morimoto and Geoffrey Zakarian in a frozen wonderland, where food must be served on elaborate plates carved from huge blocks of ice. 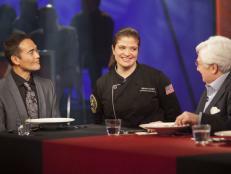 The judges are Anthony Anderson, Alfred Portale and Karine Bakhoum. Farmhouse Rules : " Canning Party (Ladies Who Can) "
Nancy Fuller is hosting a canning party for the ladies in honor of one of her favorite pastimes. She heads over to her local Hudson Valley apple orchard to pick some fresh apples for the event. She's making Hearty Butternut Squash Soup, Spiced Apple Butter, Lemon and Sugar Mini Biscuits, and Orange Tea with Honey. It's not ladies who lunch; it's ladies who can! 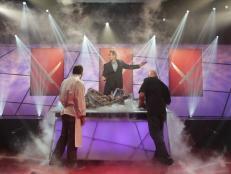 Guy's Grocery Games : " Holly, Jolly Meals "
For the first game, Guy gives the chefs a very small budget to create big, tasty grilled cheese sandwiches for four. Then the chefs are challenged creatively when they must make unusual desserts from ingredients in the meat, seafood and dairy aisle. The final two chefs shop the aisles to make their best holiday-celebration meal, but Guy swaps their bags of ingredients. Quick thinking and serious skills will send one chef on a $uper $hopping $pree with an extra holiday surprise! Restaurant Express : " Vegas or Bust "
The Restaurant Express bus arrives at the final location — the M Resort in Las Vegas — where the winner will open his or her very own restaurant! 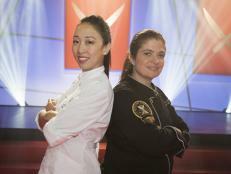 The last two chefs standing will each be given a budget of $5,000 and must create a restaurant fit for the resort. 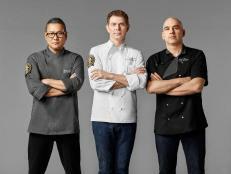 They must design their restaurant, create their menu and impress not only 100 diners, but also Robert and two M Resort executives. The chef with the best overall concept and execution will win Restaurant Express! 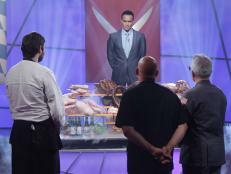 Cutthroat Kitchen : " Wham, Clam, Thank You, Ma'am "
Things steam up when a chef is forced to cook an entire meal with a household iron. Then, a chef's clams casino gets supersized with geoduck. Things finally cool down in the kitchen, except for one chef who becomes extremely shaken up while making an ice cream sundae. 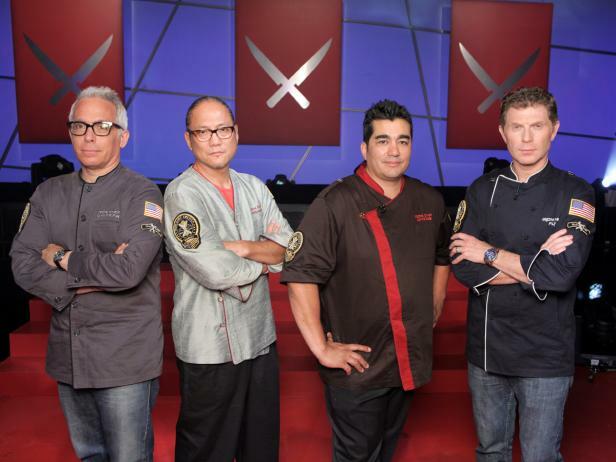 Watch all new episodes of your favorite Food Network shows this weekend and tune in for the finale of Chopped All-Stars and the premiere of Iron Chef America Tournament.